Winter in Ballarat is cold; too cold to be out in the garage and modelling. So I bring my efforts inside the house and work at the kitchen table. In spring last year I bought some Steam Era Models (SEM) GY 4-wheel wagon kits. For A$17.50 you get a high quality injection moulded kit, with a fret of photo-etch to go along with it. While this may sound pretty good value, it is really great value when you consider that for ready to run sets of 6 wagons you are paying around the A$240.00 mark plus shipping. Let’s get into the meat of the build. I’ve not built any Australian railways kits which is unusual since I am Australian born and bred. However the SEM kits are really good starting points for going all out detailing and upgrading of the basic kit to my preferred modelling standard. I am working toward building wagons that are in the last years of life. That is in the mid to late 1980s as all the wagons were withdrawn from service and scrapped by the early 1990s. 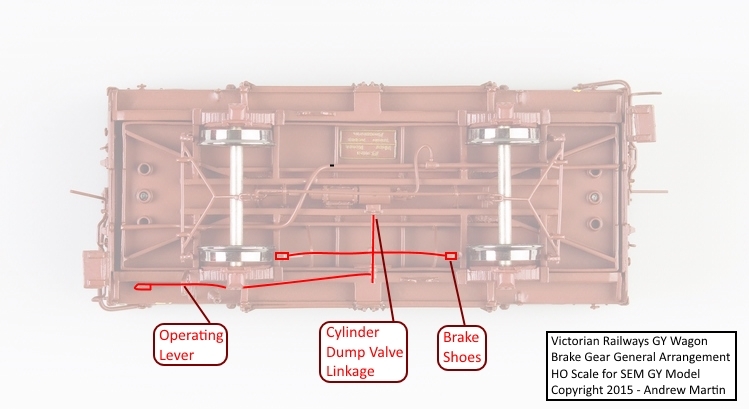 For the underframe, which has a lot of good basic detail, I want to add more detail including the the brake pipe (shown in image 1 below), upgrade the combined reservoir, brake cylinder and triple valve by adding a little detail to the combined unit and adding the airline from the train brake pipe (shown in image 2 below). * A quick note, images 1 through 4 show layers, from the casting downward, with additions that are made to the model. A higher numbered image has detail further away from the bottom of the casting. 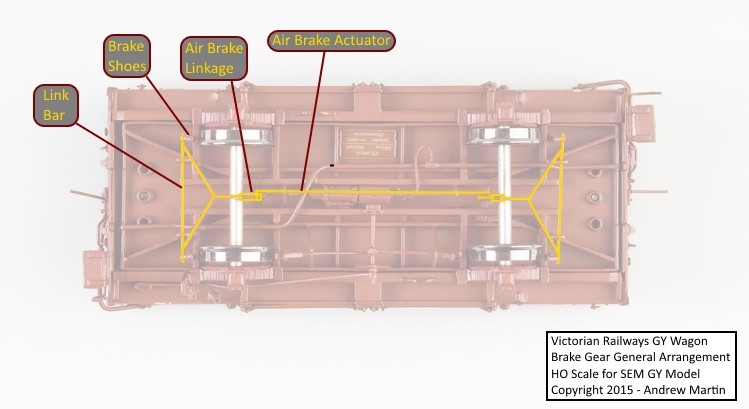 Next on the list of upgrades is to add missing parts of the air brake rigging not provided with the kit. 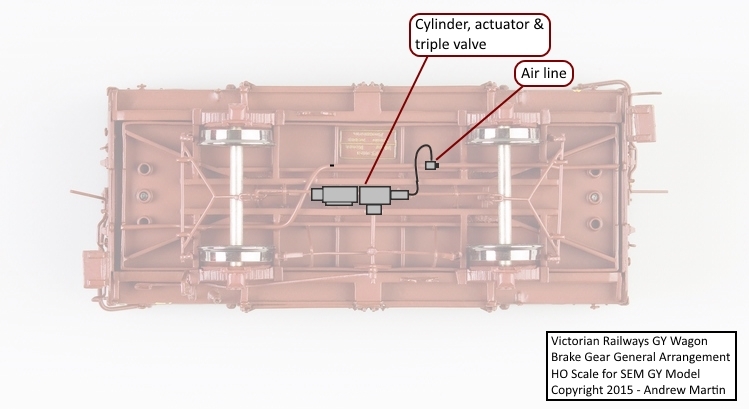 The triangular section leading to the linkage needs to be added (as shown in image 3 below) along with the linkage from the brake cylinder actuator. I am not going for precision here but a representation. Additionally I need to add the release wire to both sides of the wagon. 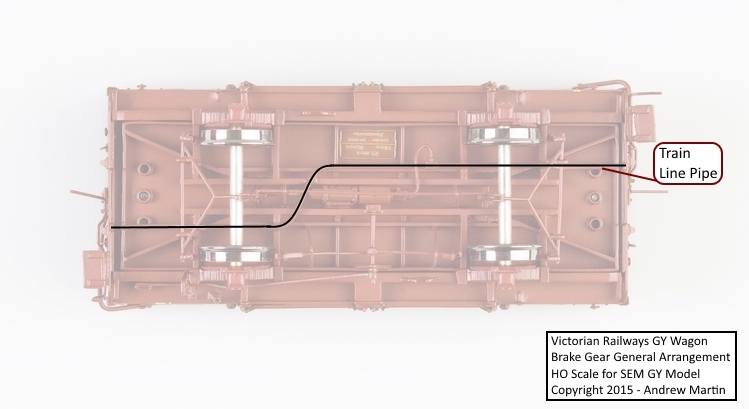 This allows the air to be dumped when the wagon is uncoupled and the hand brake is applied. This should give a very nice representation of the vehicles in action. There’ll be more in this series in a week or so. 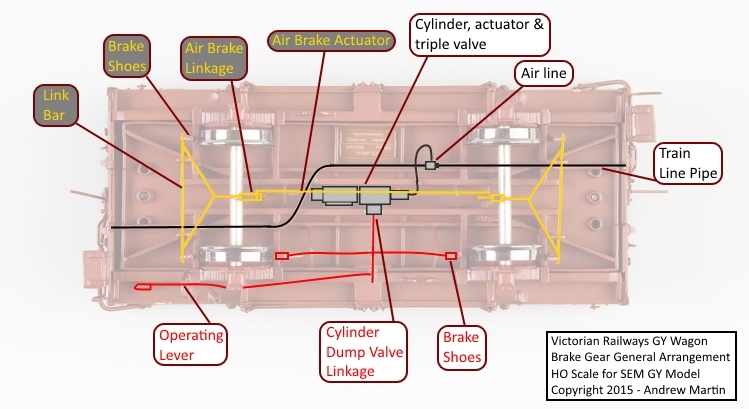 You can find out more about Victorian Railways braking systems by downloading this PDF guide to Westinghouse air brake equipment from David Baillie’s website. Take some time and look around here as their is a lot of great information that David has produced and shared with the community.